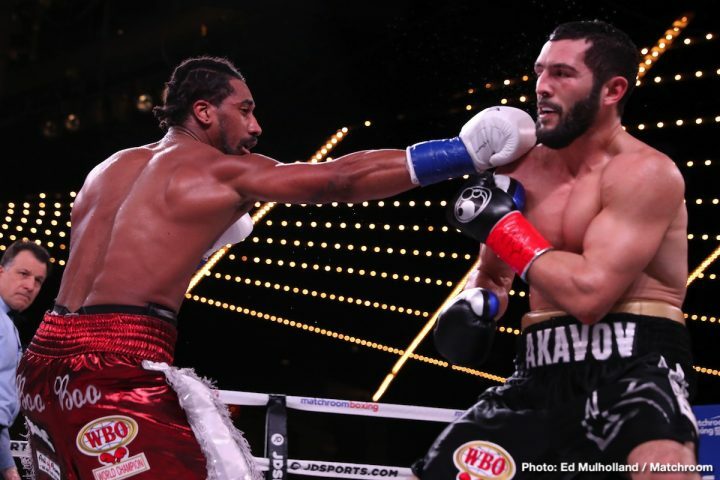 By Sean Jones: Making his first defense, WBO middleweight champion Demetrius ‘Boo Boo’ Andrade (27-0, 17 KOs) stopped the light hitting fringe contender Artur Akavov (19-3, 8 KOs) in the 12th round on Friday night on DAZN at Madison Square Garden in New York. It was not a thrilling fight unless you like watching one-way action, and constant movement. The fight was marred by the premature stoppage by referee Arthur Mercante Jr., who pulled the plug on the fight after Andrade hit Akavov with a shot that caused him to lose his footing along the ropes. Mercante obviously felt that Akavov wasn’t doing anything to make the fight competitive, so he chose to stop the fight. With that little time left in the fight, you can understand why Akavov was so upset. He had fought hard to go the distance, and then that was taken from him by a referee that decided he didn’t stop it despite Akavov not being hurt. The stoppage made Andrade and the referee look bad. Andrade looked bad because the knockout was connected to him, as he didn’t have the power or the ability to stop Akavov without the referee making an odd decision. Most referees likely would have let the fight play out, but this one hastily stepped in and prematurely stopped it. Immediately the fight was stopped, Andrade, not realizing that the boxing fans were deeply upset, started dancing and celebrating his victory. The dancing by Andrade had the same effect as throwing fuel on a raging fire, as the fans started booing Andrade. The smile on Andrade’s face disappeared, and was replaced by a grimace. The fans weren’t upset at Andrade. they were angry at the strange stoppage by the referee. Andrade celebrating the stoppage gave the impression that he endorsed the decision by the referee, and that was a clearly a mistake on his part. What Andrade should have been doing was shrugging his shoulders to distance himself from the the way the fight was stopped by the referee. After the fight, Andrade called out former IBF/WBA/WBC middleweight champion Gennady Golovkin for a fight. “I felt good,” Andrade said. “I’m looking to get in with the best. The jab was working beautifully. At the end of the day, if you put GGG [Gennady Golovkin] in front of me, I’m going to destroy him. I’d pick him apart. It’s a fight,” Andrade said in explaining what happened when he was hurt in the ninth round by Akavov. “I’m going to keep beating the top 15. Eventually, Canelo and GGG will be the only ones left. I’m not interested in Billy Joe Saunders. He’s unprofessional. You heard who I called out [Canelo and GGG],” Andrade said. Andrade’s promoter Eddie Hearn of Matchroom Boxing USA is hoping that Gennady Golovkin will show interest in fighting Demetrius next, since he currently doesn’t have an opponent for his next fight, and he holds one of the middleweight titles. Canelo is already scheduled to fight IBF 160 lb champion Daniel Jacobs on May 4 on DAZN, so he’s not available for GGG. If Golovkin signs with DAZN, then Hearn wants him to fight Andrade straightaway. The way that Andrade seemed to be shaken up each time the light hitting Akavov hit him with a solid shot, it’s doubtful that he would be able to beat Golovkin. Andrade’s chin is shaky, very shaky. When you’re getting hurt by a light puncher like Akavov, it’s not a good sign. Akavov, 33, was unhurt, however, and he was absolutely furious at the fight being stopped. Each time Mercante tried to get near Akavov to let him know why he had stopped it, the Russian fighter moved away from him out of disgust. The interesting thing about the stoppage was Mercante chose to stop the halt the fight with Akavov unhurt. Three rounds earlier, Andrade looked to be genuinely hurt after taking three hard head shots from Akavov. The referee Mercante didn’t jump in and stop the fight on that occasion. Andrade was clearly hurt, but Mercante left him in there. Ultimately, the stoppage in the 12th didn’t change the outcome in the real sense. There was only 24 seconds left in the fight, and Akavov wasn’t throwing punches. He was just trying to go the distance. The fight was only interesting in the first three rounds and in the ninth. Those were the only rounds where Akavov was throwing punches. Most of the other rounds, Akavov was just moving in circles, trying to make the 6’1″ Andrade miss with his punches. He did a good job of accomplishing that goal. Andrade missed often with his shots, but he was the only one throwing. Those are fringe level fighters, and not top guys. If Hearn wants to help Andrade’s career, he needs to start picking out talented contenders, preferably top five guys rather than obscure fighters or guys that have already been beaten. The problem is the WBO’s top 15 contenders are not particularly talented guys. Andrade’s promoter Eddie Hearn would do well to match him against the likes of Sergiy Derevyanchenko, Jack Culcy, Maciej Sulecki or Esquiva Falcao. With the weak contenders, and the poor level of opposition that Hearn keeps matching against Andrade, it’s going to be difficult for him to increase his popularity. The best thing that could happen for Andrade is if GGG inks with DAZN too, because that company will likely be interested in seeing the middleweights signed with them facing each other rather than fighting non-DAZN fighters all the time. If Golovkin signs with DAZN, it would mean that Canelo, GGG, Daniel Jacobs and Andrade would be the four middleweights. There would also be Jaime Munguia, who currently holds the WBO 154 lb title. Munguia is expected to move up to middleweight sooner or later. With those guys signed them, Andrade might get a chance to fight Canelo, Golovkin and Jacobs. We might even see rematches. Golovkin has other options though. If he signs with Premier Boxing Champions, then he could continue to have his fights on pay-per-view when he faces a popular fighter on occasion. There aren’t any popular middleweights with PBC other than Jermall Charlo, and the junior middleweights Jarrett Hurt and Jermell Charlo. Akavov threw very few punches after the first three rounds. The fight was very hard to watch due to the lack of action. It was not an entertaining fight. It was the opposite. It bad match-making to the extreme. When the Andrade vs. Akavov fight was first announced, this was what expected. With Hearn’s deep pockets, he can get much better than Akavov for Andrade to fight in the future. Hearn shouldn’t just bank on Canelo, Golovkin or Jacobs one day fighting him, because they may never do it. Andrade isn’t popular, and his performances are not throwing to watch because he fights in a lazy manner, and his chin clearly isn’t the best. The way that Andrade was shook up by Akavov in round nine, it’s scary to think about what GGG, Canelo, Charlo, Jacobs and Munguia would do to him if they were the ones landing those power shots tonight.